Location: Hoi An is an old town down the Thu Bon River, on the coastal plain of Quang Nam Province, about 30 km south of Danang. After a long period of absence from the tourist map, this lovely town started to draw the attention of visitors and researchers at the beginning of the 1980’s. What is so special about Hoi An is that this little port town is in an incredible state of preservation. It offers some of the most densely concentrated sights in Vietnam with its old streets bordered with ancient houses and assembly halls, its pagodas, temples, ancient wells and tombs. In total, more than a thousand places of interest. 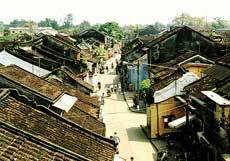 The architecture of Hoi An is characterised by a harmonious blend of Vietnamese, Chinese and Japanese infl uences. After many centuries, Hoi An is still respectful of its traditions, folk festivals, beliefs and of its sophisticated culinary art. Set in a quiet environment, Hoi An is surrounded by peaceful villages, a beautiful river, the sea and sunny beaches.